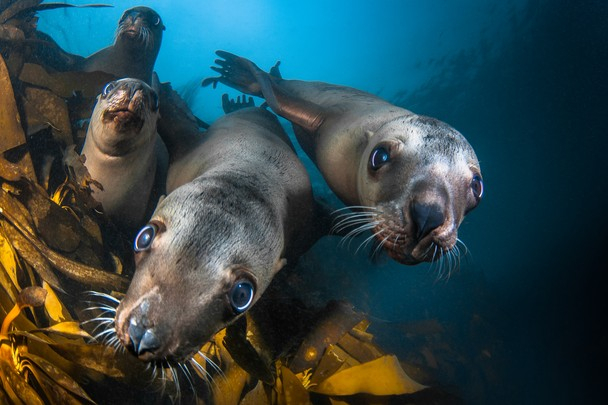 I can always count on the annual National Wildlife Photo Contest to provide some amazing water-related photos — and the 2014 contest was no exception. This is the 44th year for the contest, sponsored by National Wildlife magazine and the National Wildlife Federation. 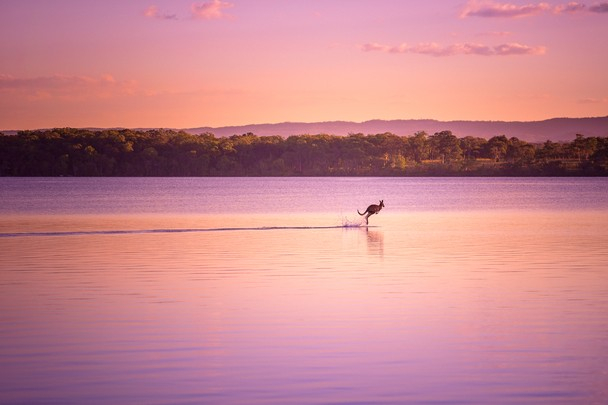 This year’s contest attracted more than 29,000 entries, according to a statement accompanying the winning photographs. 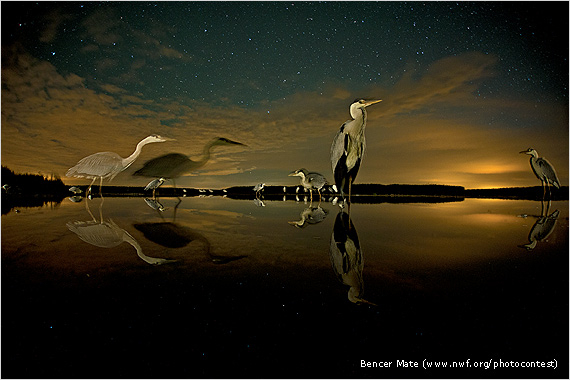 The winner of the Grand Prize, Hungarian photographer Bence Mate, spent 74 nights in a blind over a period of several years to figure out how to capture this remarkable image of gray herons in Hungary’s Kiskunsag National Park. By experimenting with his camera gear, he was able to capture a clear image of the birds and water in dim light, while also showing us the stars, which were not in the same depth of field. His home-made equipment was able to achieve good exposure throughout the scene. “I made the photo with a fish-eye lens that was less than a meter away from the closest bird and had to be careful not to scare the herons with noise or light,” he was quoted as saying. The birds kept moving during the 32 seconds that the shutter was open, “and they created interesting forms in front of the starry sky,” he noted. 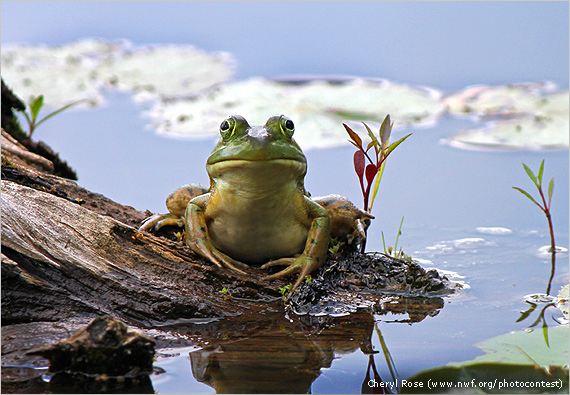 I like the whimsical appearance of this bullfrog, captured by Cheryl Rose of Hopkinton, Mass., as she explored Waseeka Wildlife Sanctuary in Central Massachusetts. The water seems to wrap around the log, becoming part of the sky with clouds in the distance. 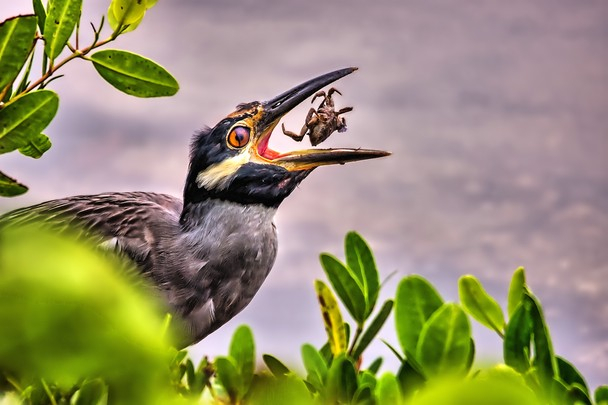 The photo won second place in the Other Wildlife category — a category for something other than birds, mammals, baby animals and backyard wildlife. 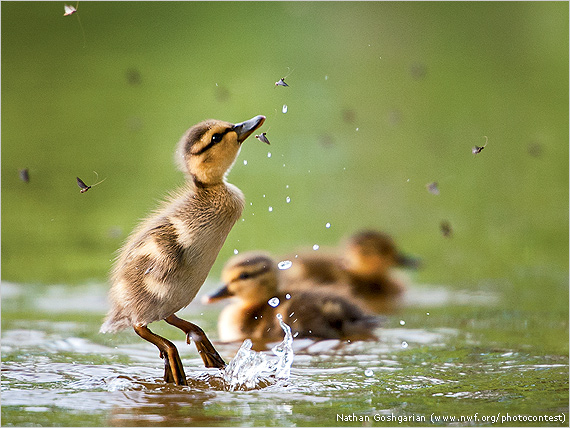 First place in the Baby Animals category went to Nathan Goshgarian of Woburn, Mass., who watching as this mallard duckling leaped at flies swarming over Horn Pond in his city. “It had the incredible ability to select a single fly from the seemingly random movements of the swarm and launch itself out of the water,” he said. 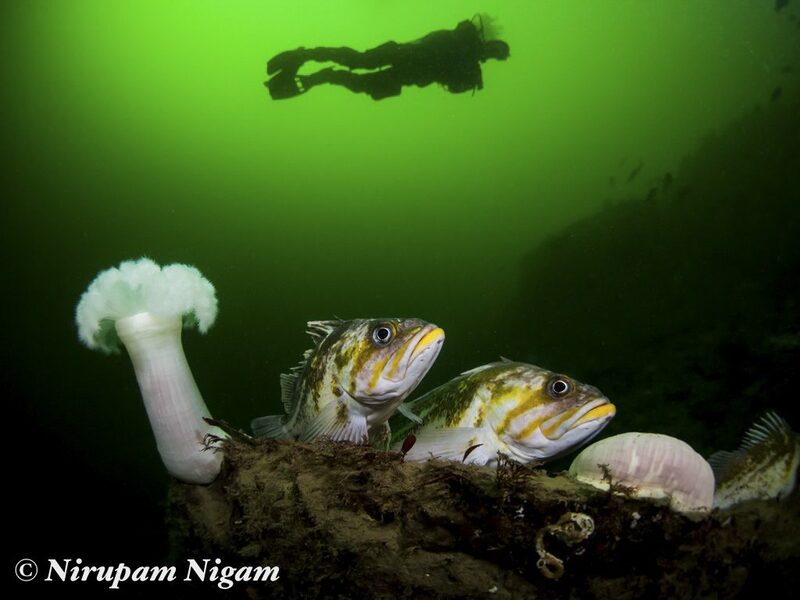 Check out 17 stunning photographs, with comments from the photographers, on the National Wildlife website. 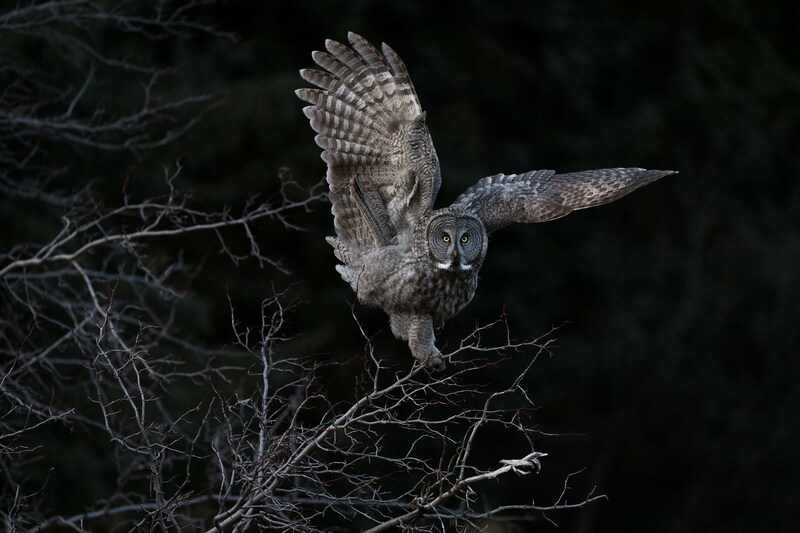 An amazing collection of wildlife photographs came together in the 2009 contest sponsored by National Wildlife Federation. These are pictures that touch you with their beauty, inspiration and humor. 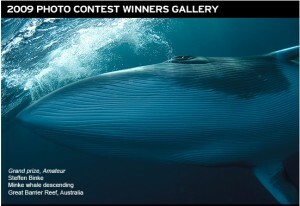 The photo at right shows a minke whale descending the Great Barrier Reef off Australia. The picture, by Steffen Binke, won the Grand Prize in the amateur division. To see a slide show of all 32 winners, visit the Web site of National Wildlife magazine. I hope you can take a few moments to enjoy them. Other entries were so good that the magazine put together a slide show of 60 honorable mentions that are worth seeing. If you are a photographer interested in entering the 2010 contest, you will find information on the online magazine’s Web pages.